The Schedule Equipment‍ tab is where Core Customers can review the schedules of a core's resources and make reservations. Note: this tab may be named differently for each specific core. If your core uses the iLab Kiosk, please see Using Kiosk‍ for more information on starting sessions. View schedule: click on this button to open up to view the schedule for this resource and to make reservations. Access the calendar by clicking on the resource name or the "View Schedule" button. The schedule then opens up, as illustrated below. Return to Schedules: This will return you to the main Schedule Equipment tab. Schedule: This tab displays current schedule for the all of the Resource sets. Description: This displays a description of the equipment. Other Schedules: This tab allows you to view and access other equipment listed and calendars, for easy navigation. Orange Events: In some cases, cores require core approval for reservations. If you have reserved time on the calendar that requires core approval, that event will be in orange. When the reservation has been approved you may receive an email and you will see the event turn to purple. Purple Events: When a reservation is approved by the core it will turn purple. Forward/Backward: move forward (">") or backward ("<") in time, in steps equal to the chosen time frame. Full screen: show a full-screen version of the schedule. Click this icon again to return to the windowed version. Schedule: show all reservations on the schedule for the currently selected resource. See the note above under legend for an explanation of the colors. Drag and drop in this area to make a reservation. If your schedule shows an additional set of filters at the very top of the calendar, refer to the section on configurable reservations. Reservation details: Verify key information about the reservation, such as the specific resource, the lab and when it was created. If there are multiple instances of a resource (e.g. if a core has multiple physical instance of the same equipment), you will be able to pick the specific instance in the "Specify the required resource" drop-down. You can also leave a note in the reservation, and indicate if it is visible to all users, or only the core staff. Times: Verify that the times of the reservation are correct. If you want to make any changes, click on the pencil icon, update the information, and then click the green check mark icon. Use and cost of reservation: Verify the usage type (e.g. assisted or unassisted) and the cost of the reservation. Note that the cost may depend on the selected usage type. Payment information: Select your payment method. Invite additional people to this event by email: If you would like to invite others, enter their email address to forward an invite to them. Save / Cancel: Click "Save reservation" to save the reservation as currently configured. 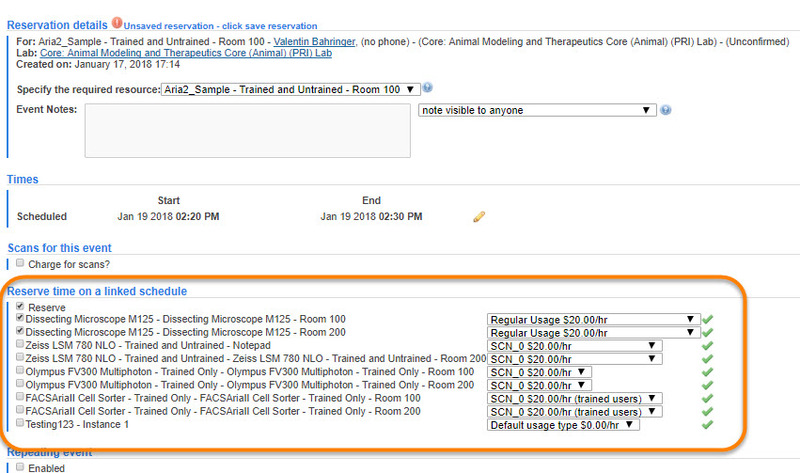 Click "Cancel reservation" to go back to the equipment schedule without saving any changes. Delete reservation: If this option is available, it will completely delete the reservation and release the reserved time. For more information on deleting/cancelling reservations, see below. Add comment: You can add a comment that will be tracked on the panel at the bottom of the reservation. The core may also add comments in this area. Users can update the reservation, within certain constraints set by the core. For example, if the core requires approval of reservations, they cannot be changed after they have been confirmed. Also, a core may have configured limits to how close to the reserved time slot the reservation can be changed or deleted. Click on the reservation to bring up the edit mini-menu to the left. Then, click on the bottom event icon to open up the reservation detail window, as discussed in the Create a Reservation section. Double-click on the reservation to open up the reservation detail window, as discussed in the Create a Reservation section. 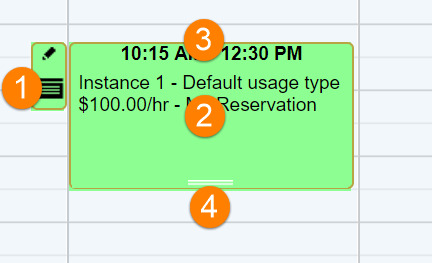 Drag the bottom of the reservation (two white handle bars) up or down to extend/reduce the length of the reservation. Note that you can only change the end time by dragging in this way. Delete reservation: If this option is available, it will completely delete the reservation and release the reserved time. This can typically only be done up to a maximum number of hours before the start of the reservations as determined by the core. If you try to remove the reservation closer than this specific time, the option would change to "cancel reservation" (see below). When reserving a resource, some cores may allow you to establish a repeating reservation over a period of time. If this is the case, the reservation form will show a Repeating event section. 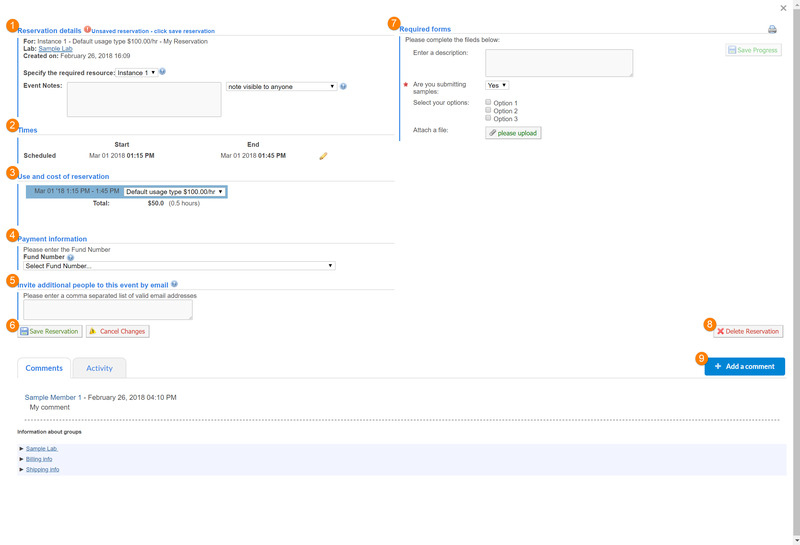 If you would like to create a repeating reservation, click on the Enabled box under the Repeating event section. This will expand the section and allow you to choose your schedule. Cores that offer services with costly setup and/or changeovers may use configurable reservations to offer customers a way to find time slots that match with their specific configuration needs. For example, a core can set specific time on the calendar to one configuration (e.g. specific microscope head and specific material needed will only be available on Tuesday from 9 am- 3 pm) and then set another time on the calendar for another configuration of the instrument with different materials. Go to the week date you wish to reserve on then select the configuration criteria by clicking on the grouping and selecting the desired attributes. Once those are selected, click the "Search" button. The calendar will display matches in white, where there is no planning in blue, and where users cannot schedule in grey. You can also hover over the match areas to see what the planned configuration is for that time slot. To save the reservation, click the "Request Reservation" button. If you have selected attributes that do not match with that day, an error message will display in the Attributes box. For certain schedules, a core may have configured linked resources that can be automatically reserved at the same time. If this option is available, the reservation form will show a Reserve time on a linked schedule section. This will expand the section and allow you to select additional resources. The current reservation will also be applied to the linked resource.